I have been receiving questions lately from people who are puzzled when companies use different parameters than their competitors use to specify the endurance of their SSDs. How do you compare one against the other? Some companies even switch from one parameter to another to define the endurance of different SSDs within their product line. I have found that Intel uses three different endurance measures for its products: DWPD (drive writes per day), TBW (terabytes written), and GB/day. There’s not any real difference between any of these measures – each one is one way of stating how many times each of the SSD’s locations can be overwritten before the drive has gone past its warrantied life. The relationships between these three measures are illustrated in this post’s graphic. You can click on it to see an expanded version. It’s all pretty simple. We’ll spell out the relationships in detail below, but in brief, if you want to compare two SSDs that are specified using two different measures, all you need is one of those measures (TBW, DWPD, or GB/day), the drive’s capacity, and the warranty period or lifetime of the SSD. 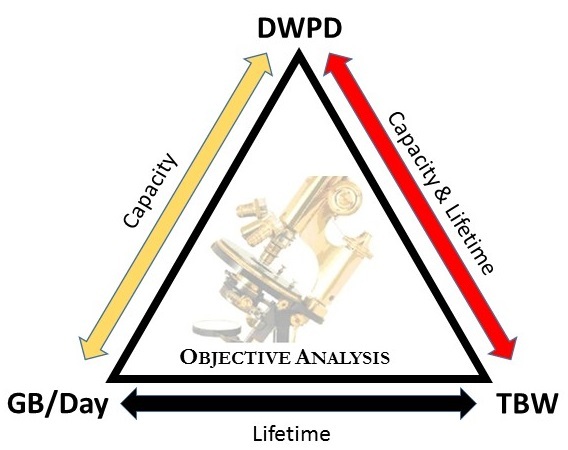 Since the lifetime is usually expressed in years, and since DWPD and GB/day are measured in days, then you will also have to multiply the warranty period by 365 to find what it is in days. You may also need to convert from GB to TB or PB or back. For some reason Intel converts these using decimal 1,000s instead of the computer scientist’s way of using the binary number 2^10, or 1,024. Regular readers of The SSD Guy will have already seen a post that explains how to convert terabytes written (TBW) to drive writes per day (DWPD). Intel sometimes uses a third measure for the same thing, and that’s GB written per day (GB/Day). These can all be calculated from each other as long as you know the SSD’s capacity (I’ll use GB here instead of TB) and its warranty period (measured in years). To give an example of how that can be used, let’s pick some Intel SSDs at random and calculate the missing parameters. In the table below (copied from an Excel spreadsheet) the white cells represent specifications provided by Intel and the yellow cells are calculated from these numbers. To make the comparisons relatively similar I have chosen SSDs that all offer close to 1TB of capacity. Most of these SSDs provide only a single one of the three endurance measures, but the SSD 750 shows two. The SSD 750’s TBW and GB/day match the values we can calculate based on one another. 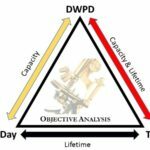 I happen to be most comfortable with DWPD, so let’s talk about that column. A few years ago SSD users, particularly those using SSDs for enterprise applications, focused a lot of attention on this figure and always wanted the largest number the SSD maker could provide. Higher numbers increased the cost of the SSD because one of the tricks used to increase endurance was to increase the overprovisioning of the SSD. As the market matured users began to realize that certain of their workloads didn’t need a lot of endurance, and many started to ask for a lower price for SSDs with low endurance ratings. One particular such application is the PC, which has very low write requirements, especially when compared with the needs of real-time database applications like on-line transaction processing (OLTP). Note that the lowest endurance figure is the SSD 750’s 0.06 DWPD, a number that meshes well with the needs of most PC applications. At the other extreme is the DC P3700, Intel’s top-of-the-line NAND SSD, which supports 17 DWPD. This product is designed for the highest write-load enterprise applications. Other SSDs fall at various points between these extremes, reflecting Intel’s efforts to provide the right mix of specifications (price, performance, and endurance) to match the needs of several different user types. For this example I chose SSDs all of similar capacities. Let’s change our perspective to explore a single SSD with a range of capacities. Intel’s DC P3600 is available in five different capacities. The table below illustrates how its static 3 DWPD translates to varying TBW and GB/Day values as a function of the capacity. The relationship is simple: As the SSD’s capacity triples, from 400GB to 1,200GB, its TBW and GB/Day specifications triple as well, even though the DWPD doesn’t change. Those who have been paying a lot of attention to Intel’s recent Optane SSD announcements may be interested to see how those SSDs stack up. Two versions have recently been introduced: The DC P4800X, which is aimed at enterprise applications, and the m.2 Optane Memory SSD, which is for PC applications. The enterprise SSD’s endurance was disclosed using DWPD while the endurance of the m.2 SSD is expressed in GB/Day. Intel’s Optane SSD DC P4800X enterprise SSD is specified to last three years at 30 Drive Writes per Day (similar to the specifications used for Intel’s NAND flash based SSD DC P3700) while its consumer counterpart, the 16-32GB Optane Memory SSD is specified to last for 5 years at 100GB of writes per day. 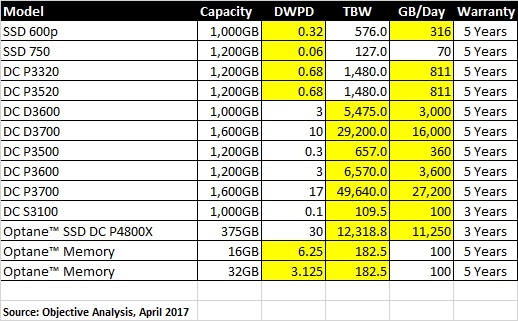 Since there are two capacities of the Optane Memory SSD, and since Intel chose to use GB/Day as its endurance specification, the DWPD numbers differ between the two, which is very different from what we saw with the DC P3600 in the second table. This product’s wear is higher than half of the NAND-based SSDs in the table, giving credence to Intel’s early announcement that 3D XPoint Memory has higher endurance than NAND flash. The Optane enterprise SSD beats that figure by a good margin, and is nearly double that of the next-higher candidate – the DC P3700 – offering 30DWPD compared to the DC P3700’s 17. Articles in the trade press indicate that the DC P4800X has about 19% overprovisioning, and this probably helps it to achieve this level of endurance. Since this Optane SSD’s capacity is low, though, the TBW number is proportionally smaller. It is unclear that the Optane Memory PC SSD uses any overprovisioning at all. This could explain why its DWPD is only 1/5th that of its enterprise counterpart. Note, too, that the DC P4800X has a shorter warranty period than most Intel SSDs at 3 years instead of 5. This reduces its TBW figure to 3/5ths (60%) that of a similar drive with a 5-year warranty, but has no impact on the DWPD or GB/Day figures. The SSD Guy hopes that this post will help clear some of the confusion surrounding these three measures of endurance, and will help purchasers understand how one SSD’s endurance compares to that of another. Jim this is a great piece and – as you can imagine – is something we have a keen interest in at NVMdurance. With 3D flash the endurance game is changing quite a bit though and it is going to be interesting to see what emerges with DWPD specs for SSDs based on 3D flash. The big difference is that with 2D each flash chip had a specified endurance that was typically a good bit less than the intrinsic endurance of the device. So there was a lot of scope for people to use a variety of techniques to apparently extend the endurance and it was not easy to determine the SSD’s DWPD performance based on the specified endurance of the flash components. With 3D devices, not only is their no headroom above the specified endurance, but unless the SSD maker pays great attention to the functioning of the LDPC error correction at each stage of life, then the flash components will not even get to the specified endurance and/or will have awful latency in later life. Thanks, Pearse, for the comment. I wasn’t aware of the headroom difference between planar & 3D NAND. The SSD business is getting increasingly sophisticated over time. The first SSDs weren’t designed for endurance, and they caused issues. Then SSD designers went to great lengths to maximize endurance and numbers were able to achieve 25+ DWPD. Recently many end-users have started to pay attention to the cost-vs.-wear trade-off, and they have found that certain systems don’t need high DWPD specifications, allowing them to purchase less costly SSDs. I suspect that this increasing end-user sophistication will allow 3D NAND SSDs to continue to enjoy increasing acceptance despite the issues you mentioned. You said that it’s: “not easy to determine the SSD’s DWPD performance based on the specified endurance of the flash components.” I agree with that, but will counter that it would seem that a medium with 1,000 times the endurance of NAND flash should have a drive life that reflects that advantage to some degree. Perhaps, as Optane SSDs ship in volume, we will see improvements in their wear specifications. 1. Is it possible to short stroking ssd drives? If so, What is the benefit ? 2. If the answer is yes to my Q.1, how does it affect its DWPD ? Glad to help. Short stroking only improves the performance of a mechanical HDD. It can’t be used on an SSD. If you tried using short stroking software on an SSD you would find that it made no difference to the system’s performance, but that it reduced the capacity of the SSD, just as it reduces the capacity of an HDD. The DWPD would remain the same. This provides some great information but in my field we are working with MDVR (DVR in trucks) which are often working for 10 -14 hours a day and depending on the type of system can be writing up to 360MB/Minute, day in, day out. SSD are attractive in this area as they don’t have the same issues as HDD which tend to fail due to excessive vibration, some last 1 year, some last 5 years but of course any drive failure causes data loss and data recovery is not usually considered unless it is critical and they client is sure that the failure occurred after the event they want to recover. 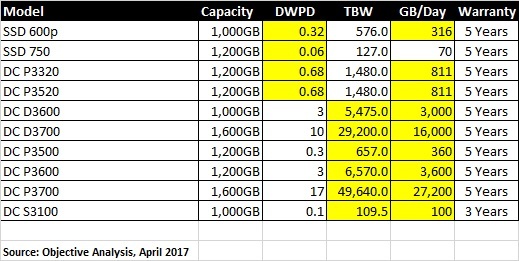 What I am most interested in understanding better is whether a higher end drive with a greater TBW value is really the way to go over a consumer drive with about 25% the TBW. I was comparing a Samsung 860Pro 1TB which has 1,200 TBW against a Crucial MX500 which shows 360TBW but the Crucial is nearly half the price. Price is a big factor for us as our customers are not in the IT industry, they are transport companies and don’t see the value unless it clearly presented in figures showing a cost benefit over time. Unfortunately, giving you advice about this is kind of like giving advice about insurance. How much does the trucking company have to lose if the data is lost? What kind of price are they able to justify? You might want to work with someone with an accounting background to figure out how to frame the options, but I would suggest coming to your trucking customers with 2-3 alternatives: Low cost, less reliable vs. higher cost, higher reliability. it might also give you some leverage against your competition, showing that you understand the problem better than they do. Hi Jim and many thanks for this post! I was looking for an easy way to translate endurance values. Not only Intel mixes these up, it’s still a bit of a mess in the entire industry it seems, though most consumer-oriented PR now seems to put more emphasis on TBW. What baffles me somewhat is that many manufacturers, including Intel and Samsung, insist on listing an MTBF value with their SSDs. Why is this? I have no engineering background, so perhaps some useful statistical parameter eludes me here, but I fail to see what it might be? As I understand, MTBF has to do with random failures rather than wear. It might be the likelihood of a solder joint failure or something equally unpredictable. The MTBF specification would be the manufacturer’s guarantee that the SSD won’t simply stop working until it had reached a certain point.